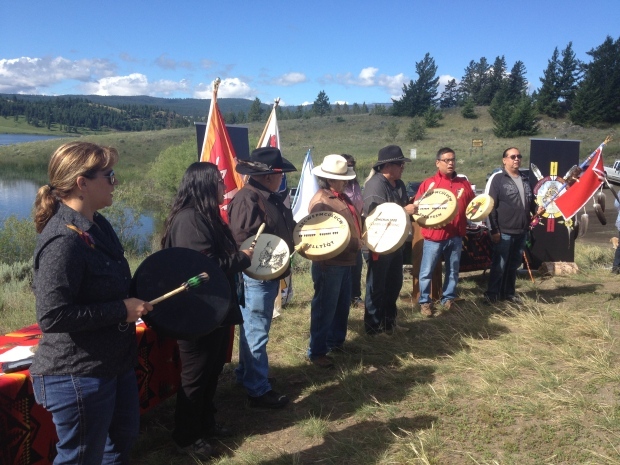 An Indigenous-led environmental review panel rejected the proposed Ajax open-pit mine near Kamloops that would destroy an area sacred to the Stk’emlupsemc te Secwepemc Nation. Between staff changes and other pressures the newsletter's been on hiatus for a while, but we're pleased to be back with half a dozen important updates. As Energy & Mines Ministers from across Canada met under the theme of ‘Clean Growth’ for their annual conference in New Brunswick, we participated in a delegation of regional and national Indigenous and advocacy groups, backed up by a 40,000-strong petition, to urge the ministers to do much more to protect the environment and communities affected by mining in Canada. We joined the voices of Maliseet First Nations that would be affected by the Sisson mine project. If built, this open-pit tungsten mine would include one of the world’s largest tailing dams in the heart of the upper Nashwaak River Valley, utilizing the same design as the failed Mount Polley mine. We also expressed our concern with the growing liability of toxic mining spills. Our estimates suggest that the total liability for contaminated sites across Canada is well above $10 billion, a figure that can easily triple or quadruple once the true costs for site clean-up and risks from spills and failures are considered. It has been eight years since Mariano Abarca, a community leader in Chicomuselo, Chiapas, Mexico, was killed for his leadership in the fight against the social and environmental impacts of Calgary-based Blackfire Exploration’s barite mine. Days later, vindicating his struggle, the mine was suspended for environmental violations. MiningWatch, the Steelworkers, and Common Frontiers have worked with partners to document the harms, bring attention to the case in Canada, file a complaint with the RCMP over corruption of the local municipal president, and reveal the unconscionable support that the Canadian Embassy in Mexico provided to Blackfire throughout the time it operated in Chiapas. This year, as the family continues their fight for justice, we helped them file a petition with the Inter-American Commission on Human Rights against the Mexican government for multiple rights violations, influenced by repeated Canadian Embassy interventions on behalf of the company. We hope the case will set a precedent, demonstrating how Canadian economic diplomacy enables or aggravates the serious risks that mining operations pose to the lives of human rights defenders in Mexico. We contributed to a new report released by the United Nations Environment Programme (UNEP), which urges governments and industry to act to stop deadly and damaging mining spills worldwide. The 70-page report, “Mine Tailings Storage: Safety Is No Accident,” highlights over 40 mining waste failures over the last decade, including 7 failures significant enough to make international news since 2014. These failures have killed some 341 people since 2008 and damaged hundreds of kilometres of waterways, affected drinking water sources, and jeopardized the livelihoods of dozens of communities. We visited the community of Didipio in the Province of Nueva Viscaya who is fighting to stop the harm being done by a mine run by OceanaGold, and to stop the mine’s expansion into a neighbouring fertile valley known for its citrus production. The mine is located at the headwaters of one of the largest river systems in the Philippines, including the Cagayan River, the Philippines' largest river. The community has already suffered contamination and depletion of its local water resources. Whereas they used to be able to drink from nearby streams and wells, these are now polluted and depleted and they have to buy water. They have also suffered loss of land for agriculture and displacement without adequate compensation. As the mine seeks to explore around the existing pit for new deposits, the community is blockading roads to stop the equipment from moving freely, but such actions are dangerous and take people away from their daily need to secure food. MiningWatch has successfully accompanied communities in El Salvador who were also fighting against OceanaGold’s attempt to start a mine in that country. We will help bring the skills learned in that struggle to work with the local communities and their elected officials to support the struggle against OceanaGold in Didipio. For over a decade, MiningWatch has been pushing for the creation of a Human Rights Ombudsperson for the Extractive Sector and the Trudeau Government may be meeting this commitment in the coming weeks. We seek a mechanism that will allow people from around the world, who have been harmed by the activities of our mining companies operating overseas, to come to Canada to file a complaint. The Ombudsperson will independently investigate the complaint, make a finding in the case, and report that finding publicly. The Ombudsperson will also recommend a remedy for those who have been harmed. Your support to have an Ombudsperson with real powers is crucial. Let’s make Canada to live up to its international human rights obligations. We need stronger, fairer environmental assessment law that respects Indigenous rights and authority, protects nature, and empowers communities. We have been working hard to ensure that the Trudeau government lives up to its promise to rebuild the environmental assessment process and “restore public confidence” in it, participating in multi-stakeholder meetings with industry and Indigenous representatives, sitting down with ministers and high-level civil servants, and coordinating public engagement. The government brought out its discussion paper on the issues on June 29, and we helped coordinate a national response to very disappointing and problematic proposals from the government. We also joined a national campaign to push the government to “get it right”, building public awareness and pressuring MPs. The campaign will continue until Cabinet makes its final decisions and starts drafting new legislation, which we expect to see introduced by late January when the House of Commons resumes sitting after the end-of-year break.